The VA Loan: Better Than FHA And Conventional Loans? There is a right program for every mortgage borrower, but for many, the VA loan stands apart for its combination of low rates, aggressive underwriting, and secondary benefits. 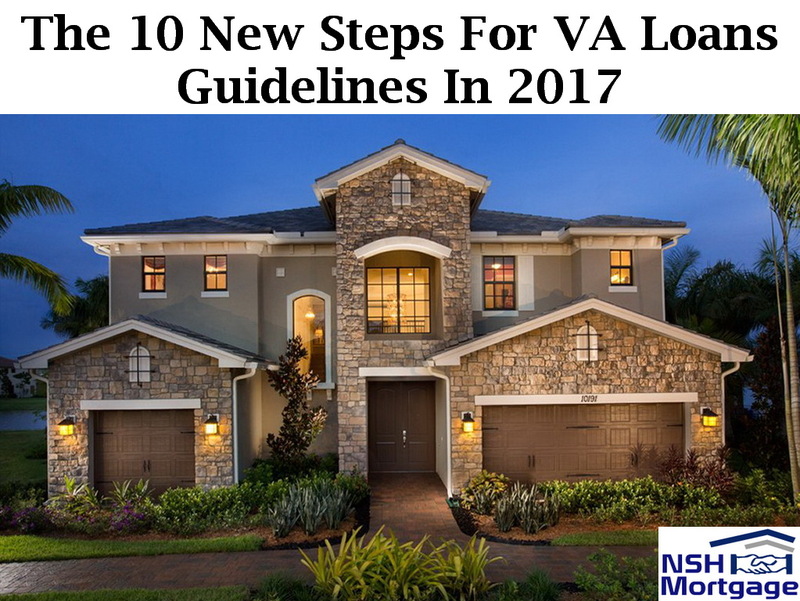 The 10 new steps for VA loans in 2017. NSH Mortgage has the knowledge and tools that can help you in the new steps for the updated VA loan guidelines. Backed by the U.S. Department of Veterans Affairs, VA loans are arranged to assist active duty military personnel. Veterans and certain other groups become homeowners at an affordable cost. The VA loan asks for no down payment, requires no mortgage insurance, allows flexible guidelines for qualification among its many other advantages. Here is an overview of the ten biggest benefits of a VA home loan. Most home loan programs require you to make at least a small down payment to buy a home. The VA home loan is an exception. Rather than paying 5, 10, 20 percent or more of the home’s purchase price upfront in cash, with a VA loan you can finance up to 100 percent of the purchase price. The VA loan is an absolute no money down opportunity. Typically, lenders require you to pay for mortgage insurance if you make a down payment that is less than 20 percent. This insurance, which others refer it as a private mortgage insurance (PMI) for a conventional loan and a mortgage insurance premium (MIP) for a FHA loan, protects the lender if you default on your loan. VA loans require neither a down payment nor mortgage insurance. That makes this a VA backed mortgage very affordable upfront and over time. There is a reason why the VA loan comes with such favorable terms. The federal government guarantees that a portion of the loan will be repaid to the lenders, even if you are unable to make monthly payments for whatever reason. This guarantee motivates and empowers lenders to offer VA loans with extraordinarily enticing terms to borrowers that want them. VA loans are neither originated nor funded by the VA. Furthermore, mortgage rates for VA loans are not set by the VA itself. Instead, VA loans are offered by U.S. banks, savings and loans institutions, credit unions and mortgage lenders, each of which sets its own VA loan rates and fees. This means you can shop around and compare loan offers and still choose the VA loan that works best for your budget. A VA loan will not obstruct your right to sell your home if you decide you no longer want to own it. There is no prepayment penalty or early exit fee no matter within what duration you decide to sell your home. Additionally, there are no restrictions regarding a refinance of your VA loan. You can refinance your existing VA loan into another VA loan via the agency’s Interest Rate Reduction Refinance Loan (IRRRL) program or switch into a non-VA loan at any time. A VA loan can have a fixed rate or an adjustable rate. In fact, you can use it to buy a house, condo, new built home, manufactured home, duplex or other types of properties. Alternatively, it can also refinance your existing mortgage, make repairs or improvements to your home, or make your home more energy efficient. The choices are yours. A VA approved lender can help you decide. Similarly, like all mortgage types, VA loans require specific documentation, an acceptable credit history and sufficient income to make your monthly payments. But, as compared to other loan programs, VA loan guidelines tend to be more flexible. This is made possible because of the VA loan guarantee. The Department of Veterans Affairs genuinely wants to make it easier for you to buy a home or refinance. The VA limits the closing costs lenders can charge to VA loan applicants. This is another way that a VA loan can be more affordable than other types of loans. Money you save can be used for furniture, moving costs, home improvements or anything else. VA loans require a funding fee, an upfront cost based on your loan amount. In addition, to your type of eligible service, your down payment size plus other factors. Funding fees do not need to be paid as cash, though. The VA allows it to be financed with the loan, so nothing is due at closing. In addition, not all VA borrowers will pay it. VA loan funding fees are normally waived for veterans who receive VA disability compensation and for unmarried surviving spouses of veterans who died in service or as a result of a service connected disability. Most VA loans are assumable, which means you can transfer your VA loan to a future home buyer if that person is also VA eligible. Assumable loans can be a huge benefit when you sell your home, especially in a rising mortgage rate environment. If your home loan has today’s low rate and market rates rise in the future, the assumption features of your VA become even more valuable.